January has cycled around again and we are once again at the start of a new year and also we are in the start of a new phase for this month. The seasonal cycles of the year with Winter ~ Spring~ Summer~ Fall ~ Winter again bring us though the year and each month we also go through the lunar phases with similar meanings. Have you ever looked at or noticed the traditional meanings behind the yearly seasons and what possibilities they can bring into our lives? Traditionally Winter has been a time for turning inward, with the world at rest and hibernating it has been a time for pondering on what has happened the past year and what you want to happen in the New Year. What seeds of inspiration you want to see sprout and grow in the Spring? Spring is for planting these seeds, nourishing them with intention and passion as well as watering them with inspiration. Summer is for seeing your ideas and dreams flourish and grow. Fall is for harvesting your creations and enjoying all you have accomplished. Winter is to start the process all over again and round and round. The lunar phases have similar meanings with the New Moon as a time for New Beginnings and this phase started on January 11th. 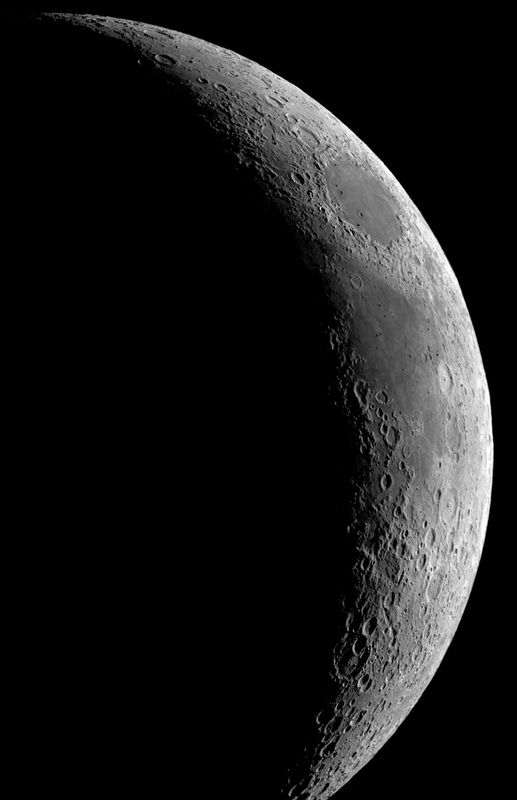 The Waxing Crescent Moon which is pictured here goes to First Quarter January 18th and to Full at January 27th. Just as you can have yearly goals that you set in the beginng of the year and watch grow throughout the year you can set monthly goals during the lunar phases. The New Moon is the time to set new intentions you have for the month or to recharge old ones that need a little boost. You can create a small ritual to help ground your intentions and help you focus one what you want over the next month. Try filling a bath with warm water, lighting a candle, play some soft music if you wish. Sprinkle some Lavender essential oil in the water if you have it to set a relaxing atmosphere. Write your intentions/goals on a small piece of paper and settle into your bath water. Breathe deeply of the candle and lavender and relax your mind. Focus on what you wrote and commit to what you plan for the next month and how you want to accomplish your goals. When you are done with your bath, you can offer your paper to the candle flame as a way of acknowledging your intentions and then blow out the candle. You may want to journal as a way to keep connected with you intention for the month. What dreams would you want to bring into being this month? How is your skin doing ? I’m opening up to channel my second Maven novel. I’m working on relaxation technique–staying awake, no nap attacks, but allowing the words to come as they will. It’s an act of faith that the story is already out there, waiting for me to type it, to allow it to unfold to me, the first reader. Thank you for the reminder of the tasks of each phase of the moon. Sometimes I forge what time it is. Here’s to accomplishing your goals for this month! Good luck on your journey!